When I came back from Summit City Comic Con last year, I had really great intentions about posting about all the wonderful artists. Well, I fell short. But since SCCC is in June, I’ve still got time. While not a long book, “The Troll and The Giant” tells the story of a young troll enraged over the Giant’s treatment of one of his favorite entertainment properties. Matt has a clean artwork cartooning style. It is a lot more Sunday funnies than a highly inked superhero opus. 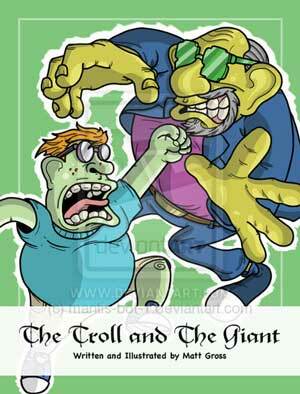 “Troll” reads like kids a book, but one that is for the kid in every fanboy (or girl). The style would be perfect for a daily or weekly strip, which brings me to Matt’s other project. 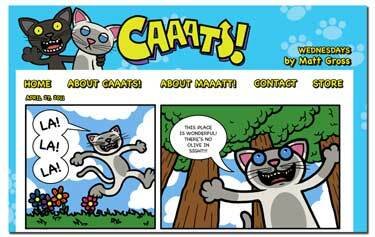 Not all that long ago, Matt started a webcomic series that has become a favorite around the Nerd household, “Caaats!” The series follows the misadventures of house cats Hazel and Olive. The comic draws it’s inspiration from the Gross’s real life cats. Since Mrs. Nerd and I share our household with 3 dog prodigies, it’s very easy to to relate to. Olive is the younger cat, and is constantly messing with Hazel’s world. If you are a pet owner, you owe it to yourself to check out Caaats! The best thing is with a constant source of material, it’s a weekly webcomic published on Wednesdays. 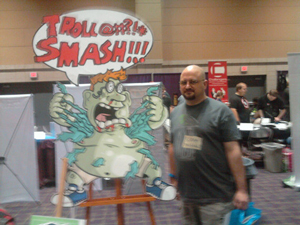 Make sure to check out Matt at this year’s Summit City Comic Con and read Caaats!